Wonderful. I’ll be more aware of the gap now than ever before. Nice piece, sir. Thank you, Lynette. I had a good time on that walk. That first photo kicks it out of the field! At night, that building is lit up with a million colorful lights. It’s a beautiful building at any time. Thank you for the tour of a different part of you town. Loved the glass encased building with its refections of the clouds. Really beautiful. 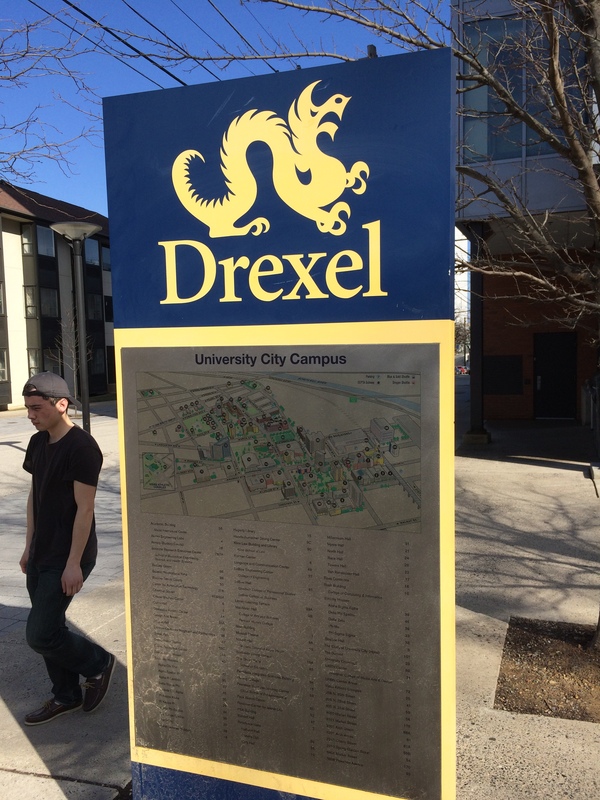 The combination of old and new buildings of Drexel College is similar to the Melbourne University precinct in our town. Great places for an amble. Hi there. Both you and I are lucky to be near places that are very much worth walking around in. It’s a good way to spend some time. 74 degrees in February? That’s crazy. With weather that lovely it would be a shame NOT to go for a walk. Alas, true winter has returned. We had a snow/wind storm three days ago that knocked out electrical power for hundreds of thousands of people. Some of them still are without power. Oh dear. The weather is all over the place. Its pretty worrying. Neil, I stopped for a while on the first photo of the Circa building as I saw the clouds were different and then realised it was actually a building. Nifty! 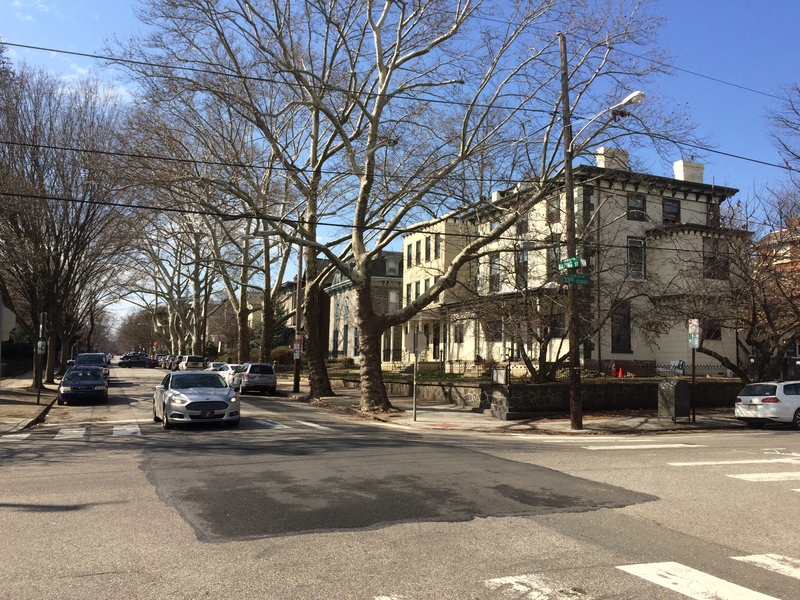 Fun to join you on this warm walk and see some of Philadelphia… lovely place and wow,such warmth! Send some over please. I liked your philosophising at the end … in the UK it’s ‘Mind the Gap’ … you leave us with something to ponder. Thanks a lot for dropping by, Annika. Walking around Philadelphia has been, I’ve come to realize, a big activity for me for decades. I think that I’ve become more aware of that since starting to write pieces for this blog in 2015. My son teases me now every time we go out somewhere as I’m always thinking ‘could this make a good blog post? !’ It does sharpen and enhance one’s perception of surroundings, museums etc. Lovely read, particularly “Mind the Gap” and indeed, it does leave us with something to think about! Philly holds memories for me. Ran the marathon there about 15 years ago. I loved running through the city; it was a great way to see it’s many lovely sights. Still, I wasn’t thrilled with how organizers planned the race route; I mean, what dolt on the committee decided it was cool to route runners back through a loop passing the finish line at the 17-mile mark? Not to worry though….another memory which is far better….my daughter graduated from Drexel! May your Monday be marvelous. I appreciate your stopping by, Cristina. You definitely have some major connections to Philadelphia. I hope that your daughter’s Drexel education has resulted in a real good career. I liked this piece on one of my favorite cities. I always thought I’d move back to Philly where I lived during grad school. I was at 11th & Pine, which was a gritty antiques district then and the far edge of Society Hill back in the early 80s. The city has changed drastically since then. Enjoyed how you really paid attention to your surroundings and just explored. Hello there. You know, when I first moved to Philadelphia (in 1974) I lived at 10th and Clinton. Clinton is parallel to Pine and only a block away from Pine. I liked that neighborhood a lot, but ended up moving to West Philly. 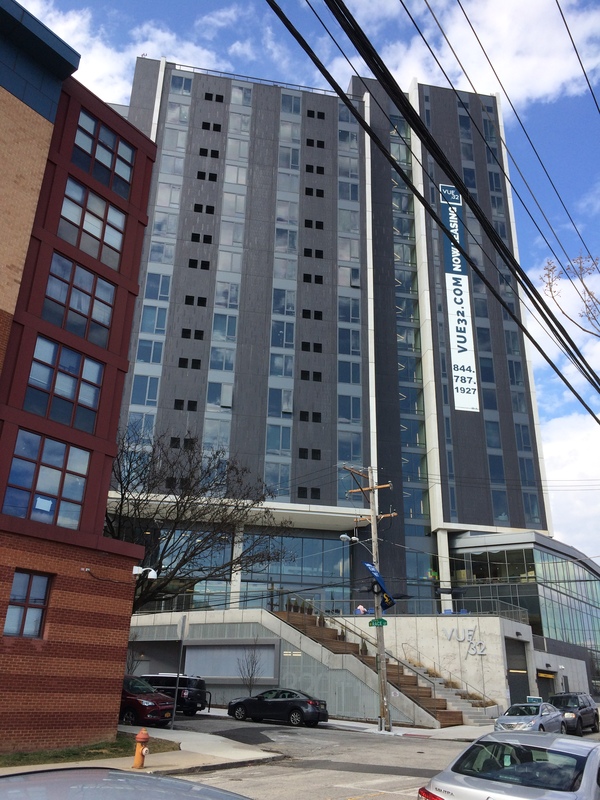 I l spent lots of time at Drexel area for theater, restaurants etc but not Powelton Villag. Hi Joyce. 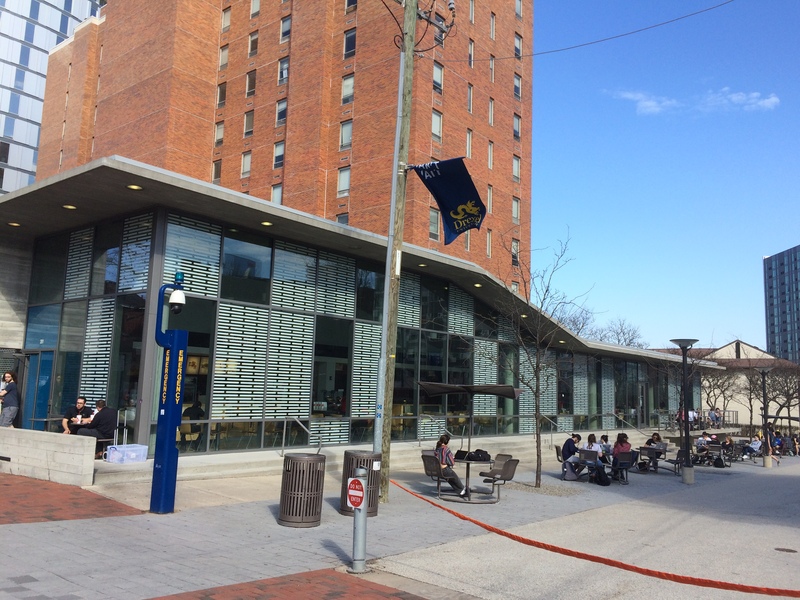 The whole of Drexel’s campus (not just the Powelton Village section) has expanded and improved so much over the years. It’s pretty terrific. A walker in the city, and nothing like a walk to lift the spirits. I so envy the availability of public transportation that you have. In Maine, it’s pretty minimal, which means most people must have a car to get to work and do all the other things one must do in life. What you say is very true, Laurie. Philadelphia’s public transit system is extensive and good (though it has plenty of faults, too). I take advantage of it. I live in the burbs, but go into Philly a lot. And I use public transit (trains or buses or subway) on nearly all of those visits. A few years ago, I spent a summer interning at the Amer.Philosophical Society’s archive, and walked around Philly. 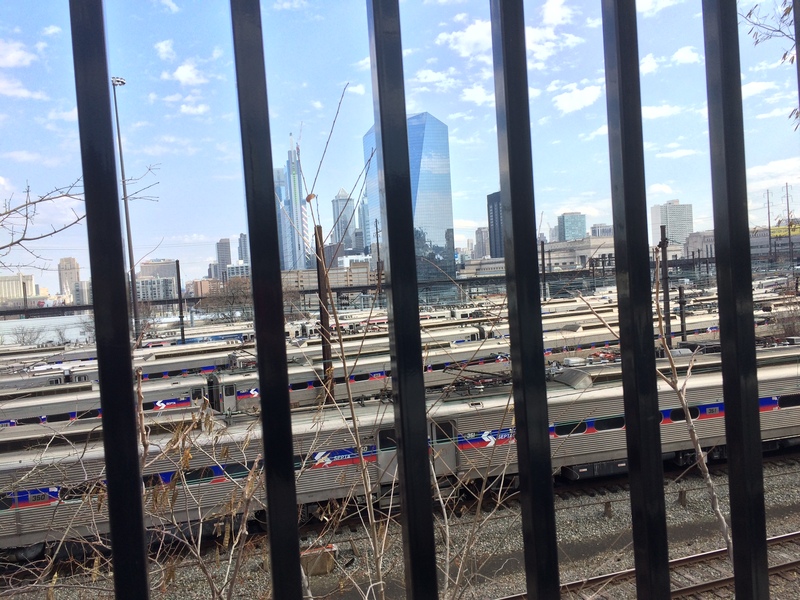 I went over the west side to see a show at the World Cafe, Drexel, Penn Park, etc. Philly is actually a great place for walks. but now wish I’d made it to the Powelton neighborhood, too. Well I’ll be back sometime! Hi, Robert. Yeah, it’s a prime city for walking. There are lots of interesting areas, and all of them are large. Many thanks. I appreciate that very much. Always something to explore in Phila? No lunch. White Dog at Penn still a favorite. I’m looking forward to some explores when weather turns warm again. I haven’t been to the White Dog in many moons. Long ago I ate often at Le Bus, which I think was on the same block as White Dog. Maybe it was a block away. An amazing travelogue, and a all that wisdom too! I loved reading about your ramblings, and so glad you took the train ride. And you had the benefit of a beautiful day! 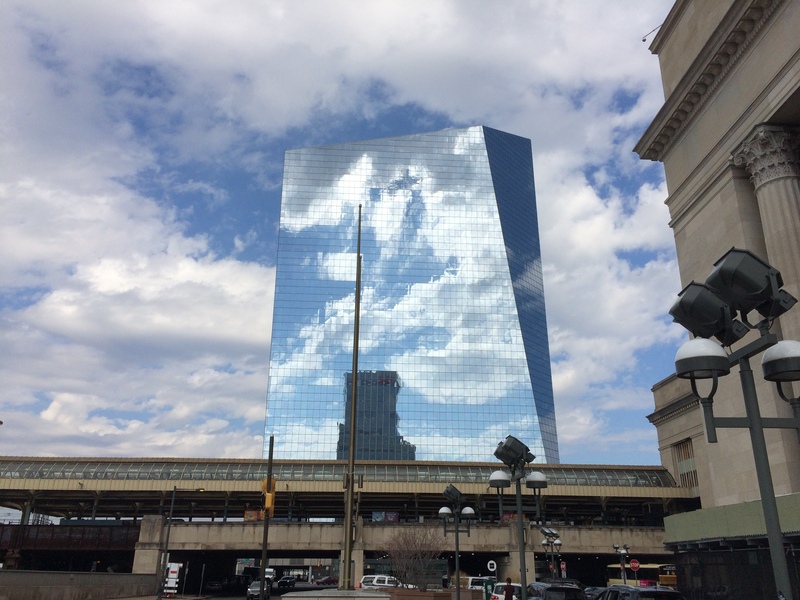 The Cira glass wonder is stunning, and seeing it should be on everyone’s bucket list, mine included. Look for your post on Twitter. Thanks for stopping by, Diane. Appreciated. And thanks for putting the story on Twitter. I appreciate that too. Thanks for taking us round your city – That Cira Centre is amazing and it took a while for me to actually spot it was there! As for “Watching the Gaps” – Wise words indeed and despite us all knowing that they need to be closing, it seems that the world as we know it is intent of widening them. Hopefully the next generation will do better in dealing with those equalities we are all too well aware of. Let’s hope that people with good sense win out over all the idiots on our planet. The human race is a highly flawed species. Thanks for adding your thoughts, Alyson. That first picture is wonderful! And i’m So envious of the temperature. The warmth didn’t last too long. We’ve had some rough weather of late. I grew up in southern NJ, so when I got to be a teenager, Philly was the place to go. On my first bus ride there, (with parents not knowing) I asked to be let off near South Street. After all, I used to listen to that jaunty rocking song that started “Where do all the hippies go? South Street, South Street.” Well, South Street had no hippies, just lots of boarded windows and doors and people sulking in the corners. I wonder if it’s been gentrified by now? Philadelphia has certainly come a long way in the past 30 years. I enjoyed my walk with you – great photos. Hi. I’m glad you stopped by my humble site. South Street was one of the best places to go (for entertainment, street life, etc.) in Philadelphia for quite a while. It lost favor somewhere in the 1990s I guess. These days it’s definitely not what it was. But there are (and always have been) real nice blocks in the “South Street” area. 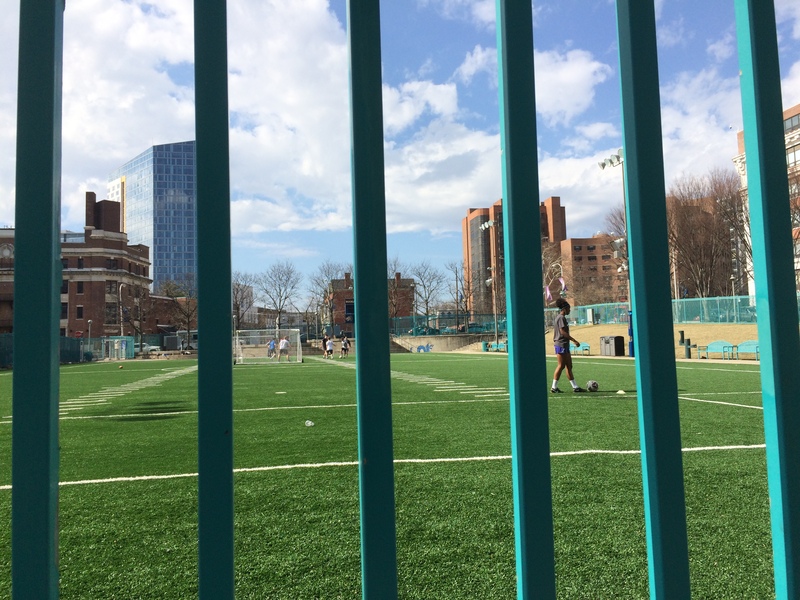 Gentrification of one sort or another is taking place in many parts of the city. I’m not sure if it’s happening around South. If it isn’t, I expect that it will. I’m glad you had a wonderful time in Philly! I am a native here, so reading a fresh perspective is interesting! I’m happy to hear you referring to the street corners and building names and all that! Its really cool. I am particularly inspired by the first picture with the clouds against the building! It’s breathtaking. Keep coming back for long walks on warm days! Hi, Sarahn. Thanks a lot for stopping by and adding your thoughts. I’ve lived in or near Philadelphia for most of my adult life. Terrific city. Lots of things to do, lots of interesting neighborhoods — as you of course know. I know what you mean about the first photo. The Cira building is something else. Even an amateur like me couldn’t mess up a photo of the way it looked that day! Your post has reminded me that there are many areas in my own St. Louis I have never bothered to walk around. And I agree with you that you notice some things only when you are on a walk! Thanks for sharing this part of Philadelphia with us. 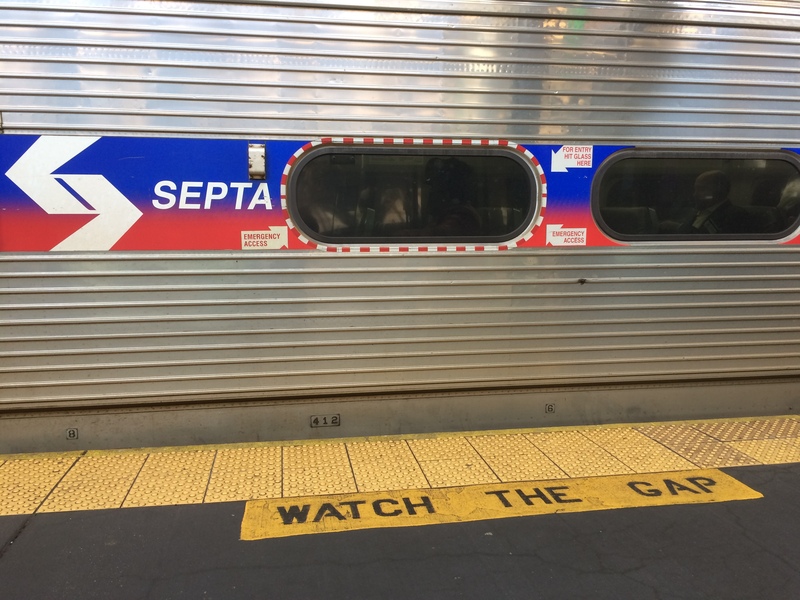 I especially liked the end of the post, not only because I agree with our comments about gaps, but because it reminded me of my trip to Ireland where we traveled on the trains. “Mind the gap” was basically their motto! You know, St. Louis is a city that I hope to visit one of these days. I think I passed through St. Louis half a million years ago, but I have no memories of it. I know that I would have a good time there. Thanks a lot for checking in, Ann. Have a good rest of the day. You just inspired CB’s next song to feature. It’s been playing in my head for a while, so i guess it’s time to let it out. Oh yeah, I would probably watch a show called Taking a walk with Neil’. A little off the cuff cometary. How’s that for an idea. Never to late. Spell check “commentary”. I’ll produce and you can be the star. We will get a sponsorship from a comfortable shoe company and away we go. I’m going to use a little shoe leather right now on a stroll. Thanks for the nudge. I like your relaxed style of writing and it’s great to hear about other people’s hometowns. BTW Thanks for liking my post. Hello there, Carolyn. Thanks for stopping by here. And thanks for the compliment — that’s a good start for my day. Great to hear from you, Claire. Yes, there’s a lot to be said for poking around. It’s a really good way to spend one’s time. Inspiring as ever, Neil. I’m going over to Edinburgh to stay at our daughter’s flat, and I love walking around the quiet residential streets in the south of the city – always have, since I first arrived there as a student decades ago. Funnily enough Robert Louis Stevenson was quite rude about what he called ‘the villa quarters’ in his book on the city, so maybe I’ll redress the balance a bit. So thanks for the inspiration, and mind those gaps! I didn’t know that RLS wrote a book about Edinburgh. If I remember, I’m going to do a bit of research into it and maybe read it. Thanks for dropping by, Andrew. I hope the weather where you are is better than it is where I am. A major snowstorm is predicted to happen here today. Oy vey! Hi Neil – it’s ‘Edinburgh: Picturesque Notes’ – don’t know if you’re a pulped wood guy like me, but if not you can get it free electronically on Project Gutenberg: http://www.gutenberg.org/ebooks/382 . So far as weather’s concerned, we’ve just had a few days of snowstorms (including thunder and lightning – quite exciting!) with an Arctic weather system nicknamed ‘The Beast from the East’ – not that much snow in the grand scheme of things, but still managed to bring us soft Lowlanders to a standstill. Weather improving now though! Gracias. I’m going to check if my local library system has this book. And to think how different those same spots will look today. Ah March. I enjoyed this post and the photos, as always. Yeah, we’re getting a lot of snow today in the Philadelphia burbs. What a drag. Now that’s some warm February weather you were having! Great that you stretched those legs and found out more about the area. I enjoyed walking with you, Neil. Hi Christy. Today is the opposite of the day I took that walk, weather-wise. We’ve had 6 or 8 inches of snow today, and it’s still coming down hard. Hey there, Kimberly. Thanks a lot for reading this piece and taking the time to add your thoughts. Philadelphia’s a fine city in many ways. I’m sure you’d like it. LOL, when I was a student at the University of London for a semester, we all took photos of “Mind the Gap” on the tube. There were even (and still are, I believe) touristo tee-shirts with that famous admonition. I’m glad you had an excellent foray out into the wilds of Philly, Neil, and thanks for the trip down Memory Lane. Amy, I like the sound of “the wilds of Philly.” You’ve maybe given me a story idea! I also love your dreamy photo of Cira Centre, Neil. I find it enriching to explore places right under our noses. May your wish of a gapless world come true. Evening, Tanja. Seeing the Cira building was a good way to start that walk. As for closing the gaps — well, we all need to keep on trying. Thanks a lot for dropping by. Have a good night. I agree-let’s all keep trying. A great spectator – you are! Inspirations tell many stories. 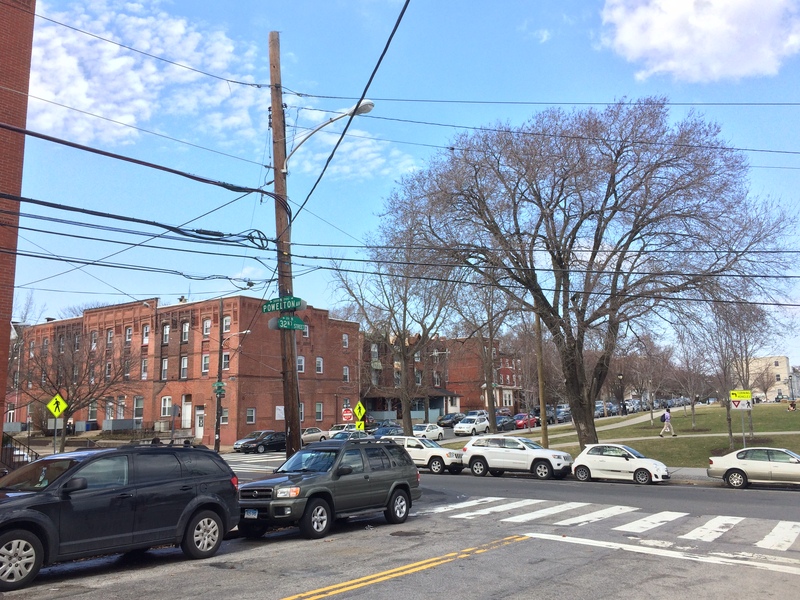 The first time I “discovered” Powelton Village, I roller bladed across the Spring Garden bridge from the Fairmount area, where I had my first Philly apartment in 1995, and lo! The neighborhood stretched before me. Later, I lived at 37th & Lancaster for some years in the 2000’s. Great to see the old hood. Thanks for stopping by, Liz. I appreciate it. In the vicinity of 37th and Lancaster I passed Stan’s Deli during the walk I took to write this story. It probably was there when you lived in that area. That went in just as I was leaving! I like their pretty painted sign on the brick wall. Yeah, it’s nice. I took a picture of it but didn’t include that photo in the story. Inspiring! Now, I wish to get off my duff and wander. Thanks! Hello there. Thanks for adding your thoughts. Wandering, I think, is often a good way to pass the time. Hello there. It’s good of you to stop by. I’m glad that you liked this story.